This post is sponsored by Wagner. All ideas and opinions are 100% my own. This post contains affiliate links to items I used during this project. Purchasing through affiliate links does not change the price for you but gives me a small percentage to keep pumping out awesome content! By now you should all know I am always game for a good furniture redo and when given a chance to use my Wagner paint sprayer I jump up and down like a kid in a candy store. Around our house we always seem to have company and often times we don’t have enough chairs. We host at least two holidays a year at our house and when both sides of our family are in attendance it can be hard to find a seat. When I saw this set of chairs on a Facebook sale group I belong to I liked the post because I loved the character they had. I didn’t really have the extra $20 to make the purchase at the time so I forgot all about them. A few days went by and the seller messaged me on Facebook asking if I was still interested in the chairs. Pay day had since come and gone so I had a little extra cash to splurge. She wanted $20 and I asked if she would take $20 since I would need to sand, paint and make new chair seats. She agreed and I picked them up on my lunch break a few days later. The following weekend (two weekends ago) I pulled out the paint and my trusty Wagner Home Décor Paint Sprayer. Guys seriously I am going to go on a rant for a minute. I have a Wagner Flexio 990 and have used it for big projects and house painting. It is great for big projects but puts out too much paint for small furniture projects. This home décor sprayer is my favorite toy of all times right now. I am in paint sprayer love… please don’t tell my husband! Step 1 – Start by sanding your piece of furniture. If you are using chalk paint you can do a rough sanding all over and don’t worry about sanding it down completely. If you are NOT using chalk paint you want to completely sand the surface down to the raw wood removing any stain or paint. For very ornate furniture you may need to use a sanding sponge or paper to get into the small details. Step 2 – Use a wet lint free cloth (I like to use baby wipes) to wipe down the piece of furniture removing any sawdust. Allow the piece to dry. Step 3 – Fix any holes or gauges in the furniture with wood filler. Apply it and let it dry. Then lightly sand to remove any uneven texture. Step 4 – Lay down a drop cloth to protect from overspray. Step 5 – Mix the paint with the BB Frosch mixture or Floetrol. I mixed mine directly in the paint sprayer canister. Mix well and then put the canister on the gun attachment. Plug the Wagner Home Decor Spayer in and start your painting! 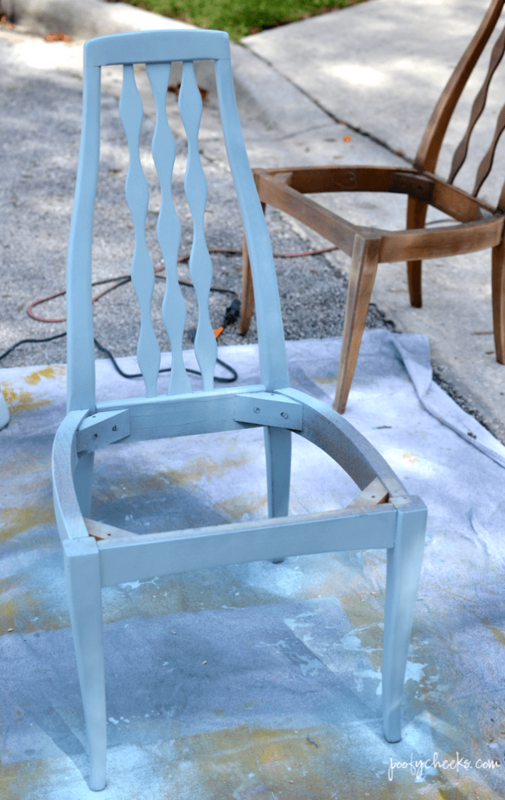 Step 6 – Let the paint dry overnight and then give a coat of polycrlylic to the furniture using the sprayer. The polycrylic is an important step because it protects the paint from scratches and anything wet they may cause the paint to come off or peel. The home decor sprayer has four paint flow settings and you can use chalk paints in it. I mixed BB Frösch (this is what I always use to make chalk paint out of latex paints) into my latex paint and filled my sprayer up. I used the lowest flow speed and it worked perfectly. The nozzle on the sprayer turns so you can spray in a side to side or up and down motion and still get maximum coverage. 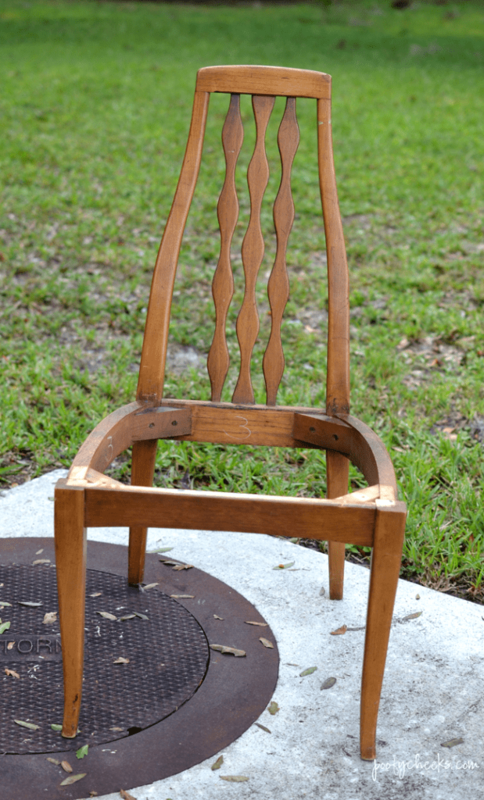 I painted each chair in about 6 to 7 minutes with the help of my two littlest babes…. if you call it help. My friend Kimberly came over the same afternoon and brought a large cabinet and hutch. She sanded and painted both of them within a few hours and then we loaded them back in her truck and she had them in our house that evening. She was in love with my little sprayer too. Her birthday was Saturday and she told her husband she wanted the sprayer for her birthday or Christmas! The price is extremely reasonable at around $80. I really expected it to be more. Watch me paint a chair and don’t mind my old raggedy paint clothes. Another thing I love about this sprayer is the cleanup. With the house sprayer you have to pump warm soapy water through the line at least three times to get the paint out. With this bad boy you can rinse out the paint canister and the sprayer in the hose and then inside in the sink. I let the paint dry overnight and then the next evening after work I filled the sprayer with polycrlic and started giving it a coat. I didn’t pay attention to the paint flow setting and it was on 4. See the overspray going on there? This is my reminder to always check your spray flow setting or you are going to waste paint and have to pull out the rags. I had to quickly go inside and find my old lint free rags to start wiping the chair down and my husband was laughing. So much for demonstrating the sprayers awesomeness when I committed operator error. I had to let it dry and sand it down then reapply another coat of polycrylic. Stop back by later this week and I will show you how I made the seats and covered them for the final reveal! Until then I leave you with a picture of my two little goonies. I would love to hear about your paint projects and see pictures too! 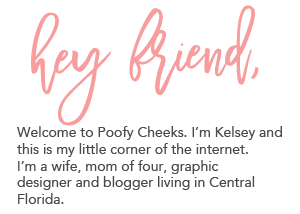 Tag me on instagram @poofy.cheeks or comment below with any questions!